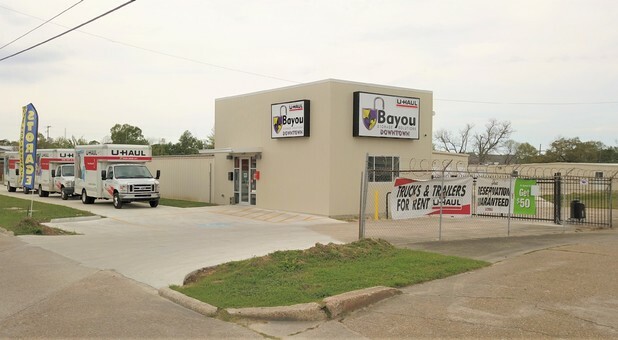 Bayou Storage Downtown - Now Open! Associate was awesome and by herself!! Easy drop off at location, utilized online ability to drop off and take pics to verify trailer at location. Easy transaction. Very friendly and helpful staff. Thank you, Laura. It was our pleasure! Thank you for choosing Bayou Storage and U-Haul, Ms. Joan. She was a very nice person soon as we walked through the door she made us feel very welcomed and she took good care of us i dont remember her name but shes an awesome person. Thank you Ms. Webb. Come see me the next time you need storage or a U-Haul! This was the most pleasant experience from start to finish. I would recommend this location to anyone. Thank you for being so awesome! Thank YOU for being so awesome, Ms. Linda! It was wonderful doing business with you. Come see me anytime! My experience was great! No problems. The lady in the office was very professional an informative. Thanks for such great service. Thank you for choosing Bayou Storage Downtown, Ms. Tanya! It was wonderful doing business with you. Mrs Becky was amazing, she helped us out so much! I can't thank her enough!!! It was such a pleasure to meet you and your precious family! Thank you for your business! thank you for your business, Ms. Canlas! Thank you for choosing Bayou Storage and U-Haul, Mark. We really appreciate your business. Thank you so much, Nikki. I look forward to doing business with you again. Hi, Mr. Martin. Thank you for choosing Bayou Storage and U-Haul. thank you for choosing Bayou Storage and U-Haul!! Thank you for choosing Bayou Storage and U-Haul! We truly appreciate your business. Thanks, Misty!! We appreciate your business. The woman who helped us was very personable and kind! She was pleasant to work with! It was very easy to rent and return to this facility. thank you for your review Alek. We appreciate your business. Ms. Illia was very kind and patient, i truly appreciate the service as well as help that she provided! Thank you. We appreciate your business and look forward to working with you in the future. This was the first time I rented from U-Haul. The manager was extremely helpful. I will definitely use them again.